Everyone looks at this piece and says something different. Floggers evoke such incredible feelings in people from lust to bile, fond memories to nightmares. They’re definitely the tool that gets right to the root of the watcher. This particular flogger is not particularly good at spanking. You see, every flogger has it’s own character. Masonry cord produces a flogger that feels like soft hair, leather is snappy and stingy, rubber is rippy or thuddy, stingy and slappy. Kevlar is a bit of a whiff and not particularly good alone, but the addition of hybrid wicks changes everything. The intended use of the Bearclaw fire flogger is a two-fold show. The hybrid wicks burn amazingly with white gas and these will produce a big, bright fairly-long show. But the real fun begins when they’re used for “fire play” or painting fire on the sub’s body. You can get two kinds of strike out of these: a thud and a whisk. The thud will usually transfer fuel, but bounce off without lighting it. The whisk will transfer flame and heat without spreading fuel. Naturally, you should be well versed in the tool and how it expresses and lights fuel before trying on a partner. The 5″ finger hybrids are a complete seal of kevlar around cotton. The 12″ falls give a lot of play between the fingers and the handle. The aluminum handle has a torch ball at the top for good grip in either sword or torch holds. But the back of the whip has a ring that can have chains attached for longer, poi-like shows. This option is better with white gas burns. Not intended for beginners, this makes a great step up from either basic torch/poi shows, or unlit flogging scenes. OMG… I think I just wet myself :P That is an awesome tool. 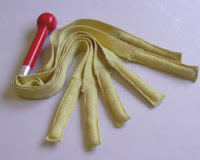 I have a question – about the structure of fire floggers. I am a long time flogger aficionado and I would like to begin to learn fire flogging. The question is this. How are the floggers loaded? By soaking? Yes, often a bucket (like our Dip and Drain) is used. Filled with fuel, dip the flogger, then pour the rest back into the fuel container.